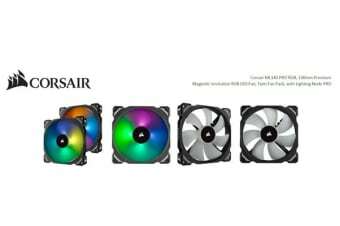 The CORSAIR ML140 PRO RGB PWM fan combines unrivaled performance and low noise operation with vibrant RGB lighting controlled by the included Lighting Node PRO in CORSAIR LINK software. By utilizing ultra-low friction magnetic levitation bearing technology, ML140 PRO RGB can deliver more airflow and higher static pressure at lower noise levels than traditional bearing fans, backed by a long-life five-year warranty. Four independent hub-mounted RGB LEDs output a vivid blast of light and color, making it easy to match your system’s style, and with a 400 RPM to 1,200 RPM control range, it’s easy to equip your PC with quiet cooling, in any color.